KHU 323P is a 1976 Bristol LH currently owned by group members Rob Leighfield and Kevin Eslick. 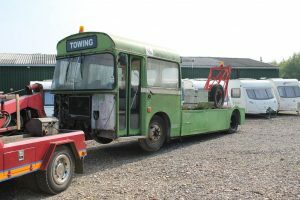 KHU323P was given the fleet number 373 and ran as a bus for only eight years before being converted into a towing wagon in June 1984. It was then renumbered W108. When Bristol Omnibus was privatised, the former bus transferred to Badgerline and remained with the company for several years before being sold. It was later owned by Stroud RE Group and then other companies before being bought for preservation by group members Rob Leighfield and Kevin Eslick in September 2014. On inspection the engine proved to be in poor condition and work will now take place to get it back to fitness before it appears at rallies and events. Subsequent owners: Badgerline, Stroud RE Group, Green Triangle, Seaford & District.